Rich deep purple with a velvet texture, ‘Valentine’ will add a touch of luxury to your garden. 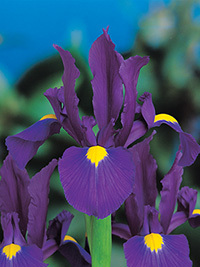 Like all Dutch irises, it is an excellent cut flower and can be left in the garden for several years. Early flowering, 75cm tall.